Autophagy is the natural, regulated, destructive mechanism of the cell that disassembles unnecessary or dysfunctional components, involving in protein degradation, organelle turnover, and non-selective breakdown of cytoplasmic components, which is evolutionarily conserved among eukaryotes and exquisitely regulated. This progress initiates with production of the autophagosome, a double-membrane intracellular structure of reticular origin that engulfs cytoplasmic contents and ultimately fuses with lysosomes for cargo degradation. 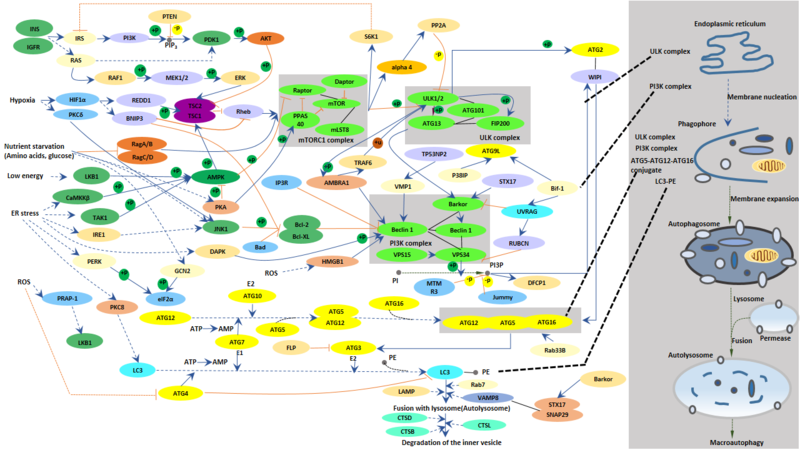 In mammals, amino acid sensing and additional signals such as growth factors and reactive oxygen species regulate the activity of the protein kinases mTOR and AMPK. These two kinases regulate autophagy through inhibitory phosphorylation of the Unc-51-like kinases ULK1 and ULK2. Induction of autophagy results in the dephosphorylation and activation of the ULK kinases. Autophagy is upregulated in response to extra- or intracellular stress and signals such as starvation, growth factor deprivation, ER stress, and pathogen infection. Defective autophagy plays a significant role in human pathologies, including cancer, neurodegeneration, and infectious diseases.